Salam & hello everyone! Oh well, 6 days of MIA I might say. Sorry guys, I have been stressed out by my Final Year Poster presentation I had yesterday, lots of work need to be done and I am totally out of my mood to blog. Sad me. My FYP isn't over yet tho, yesterday was the 1st stage. Guess I will be busy again for the weeks coming till the end of January including my Final Exam and all that. Then I will be freeeee! YEAH! Guess I need to schedule some post I want to blog about for this coming week so stay tune! I receive and used this product pretty much months ago. This have been in my skincare routine products for a very good time, well you can tell that I love this stuff! I am a fan of this collagen thingy because collagen gives lots of good benefits to the skin. Its brighten, its hydrates and it will help to firm your skin. Its a hell good of a thing to have! 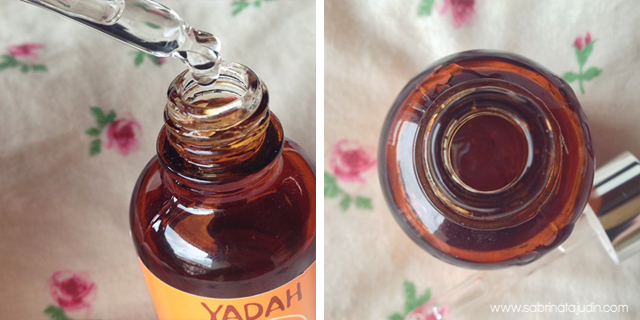 Yadah came out with two serums in their special care line actually. 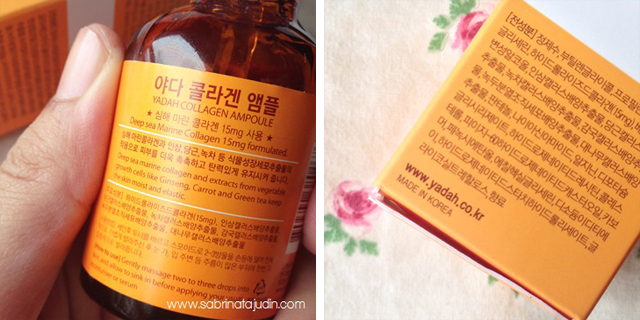 One is this one, YADAH Collagen Ampoule Serum and another one in blue packaging that is for brightening. Out of that two I by far love this much. Do tell me if you want me to review the other one called the YADAH Brightening Serum too okay. This serum claims to be, Highly concentrated deep sea marine collagen penetrates deep into the epidermis to activate collagen synthesis and help repair damaged cells, enhance skin elasticity and promote skin firmness. Potent anti-oxidant vegetable growth cells protect against free radicals to strengthen skin immunity with sodium hydrogenate to boost skin hydration. Suitable for all skin types. Can be used before a serum or moisturizer after cleanser and toner. What I think about it? I love the packaging, it comes in a light glass bottle with that "pump" dispense thing. Its hygienic and the pump dispense the product just nice. One drop of this is enough for the whole face. Does not have overpowering smell. It have a scent tho but it smells fresh and light. The texture? Its some kind of a watery thick liquid. Absorb fast and does not feel sticky at all. This is what I love about it. What I can say after a month of using this, my skin hydrates and feels plummer. Price wise, it is a lil expensive to young girls out there but this last months! I still can finish it since I have been using it for months. Another thing I try to enforce my self is using a Paraben free product like this! Since YADAH product is formulated will all 100% high quality ingredients, I think this suits young girls out there. Its not to early to use a collagen serum girls, its good for your skin. I really recommend this to all of you that are looking for a nice Collagen Serum that does not feels sticky and easy to use. What do you think of a collagen serum? Oh, I should check out if I can buy this at Sasa outlet here. Salam, nak tanya, how often do u use this? I just bought this and I'm quite unsure to as how many times a day or a week I should apply it /.\ any tips?